Everyone who is saying Windows 8 doesn't work well on desktop is spreading misinformation, just like with Windows Vista. This post is not a usual how to post and is intended to help correct up some false information that Windows 8 in not usable on a desktop. I have been using Windows 8 as my primary OS on both my laptop (convertible Tablet PC) and my desktop with two giant monitors (30" 2560x1600 and 27" 2560x1440) and I can say that I've had NO ISSUES. Windows 8 is AWESOME. The new Start Screen may SEEM like it isn't good for a desktop at first but that's false. It works just totally great. All the keyboard features are still there, you can press start and then type a few letters to search and press enter, just like Windows 7. It also still has the run commands built in, so you can type those and press enter, too, just like in Windows 7. Sure it is full screen and hides everything else, but so what? When you're launching a program from the start menu, is it really important what is going on in the background for those 2 seconds? No, it's not. There are even some advantages to the start screen in Windows 8. With the start menu on my screen I could see 16 most recently used programs plus 8 or so shortcuts on the right side of the start menu for a total of 24 shortcuts. With the start screen I can have a 12x8 grid of shortcuts and tiles for a total of 96 shortcuts and live tiles. That is FAR more than the start menu had. I have every program I ever use pinned and I have a few tiles, such as weather for a couple cities and a few stock quote tiles pinned. Just press the windows key on the keyboard or click in the lower left corner and the start screen comes up. Right when it comes up the tiles are instantly updated with the latest information. Once I've read what I want to read I can press the keyboard button or the lower left corner again and be back to where I was before, on the desktop. Windows 8 also has other very useful improvements for desktop keyboard and mouse users. 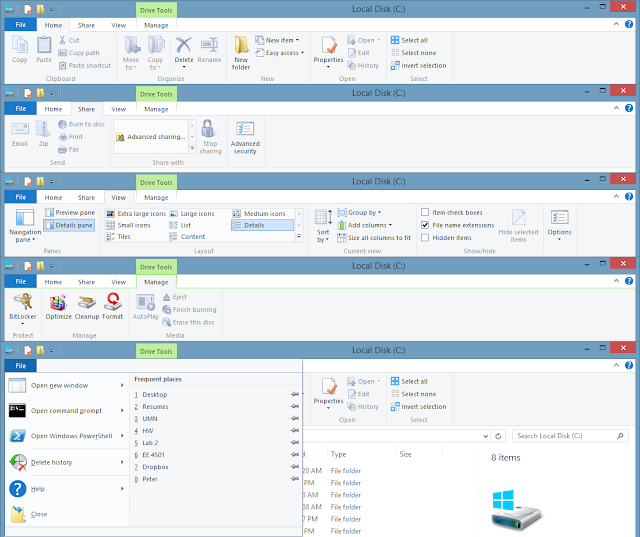 The new Windows Explorer ribbon is just AWESOME. Super quick access to a lot of tasks and options. Take a look at that screenshot. With just one or two clicks you can show and hide file extensions, show and hide hidden items, rename, new folder, view properties, select all, select none, invert selection, copy the path to the selected item, change icon size, hide and unhide items, etc. In the file menu you can even open command prompt or open command prompt as admin in the current location. In windows 7 you had to hold shift and right click to open a command prompt in that location and you didn't have an option to open one as admin in that location. You had to click in the address bar, press copy, then go to start and run command prompt as admin, then switch to the drive you're currently in, then type CD and then right click and press paste to get an admin command prompt in that location. Windows 8 is obviously much easier. You also get awesome keyboard shortcuts with the ribbon. Just press alt on the keyboard and you have great shortcuts. Invert selection? alt h s i. Super quick. Windows 7 had a lot of these like invert selection but this is much easier to figure out and use. Lots of things Windows 7 couldn't do with keyboard only (or was much more difficult) such as copy path. alt h c p.
Windows Defender has been included in Windows since Windows Vista but up until Windows 8, it only did offered anti-spyware protection. You had to download Microsoft Security Essentials or use a third-party anti-virus utility. Not anymore. 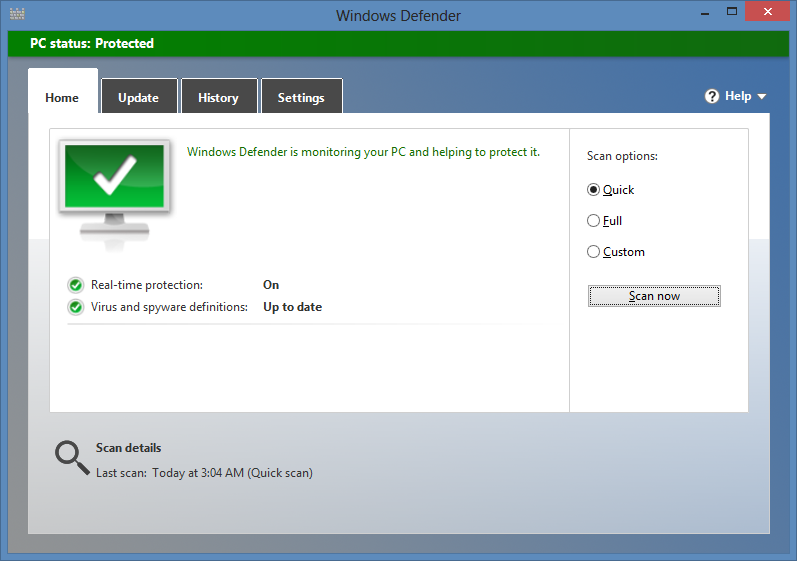 Microsoft Security Essentials has now been integrated into Windows Defender for Windows 8. It comes pre-installed and will protect your computer without any annoying notifications or demanding you pay or upgrade to a better version. Another awesome thing for keyboard and mouse users is the new WIN+X menu. Either press WIN+X or right click in the bottom left corner and you can instant access to lots of admin tools and not only that, you can just press one letter after opening it up. Win+X A opens command prompt as admin. Win+X M opens device manager. Win+X K opens disk management. Another cool feature is seamless is the new file copy dialog. It combines all file copy windows into one where it shows graphs of each transfer and the ability to pause and resume transfers. Another great feature of the new file copy process is switching of network interface while copying a file. Say I start copying a bunch of big files from my laptop to my desktop over wifi and I notice it's only going at 15MBps and I need it to go faster. With 7 and earlier I had to cancel the transfer, connect an ethernet cord, and start the copy again. Then it will get to the point where there are some half copied folders or other files which already exist and it will bring a dialog asking what to do. Or to avoid it you can delete everything copied and start again. With Windows 8 all you need to do is plug in the cord and once Windows detects the faster connection method it will switch to the faster method seamlessly. 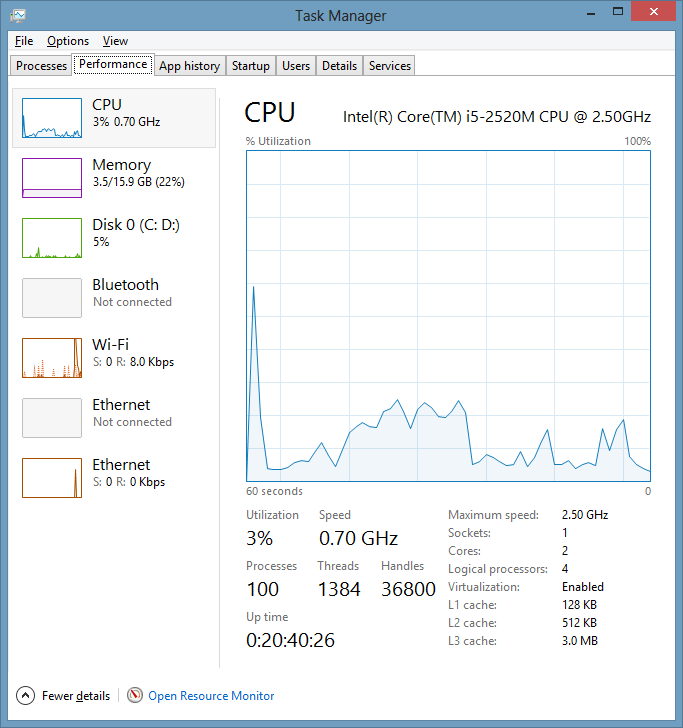 And my one last favorite new feature is the super improved task manager. 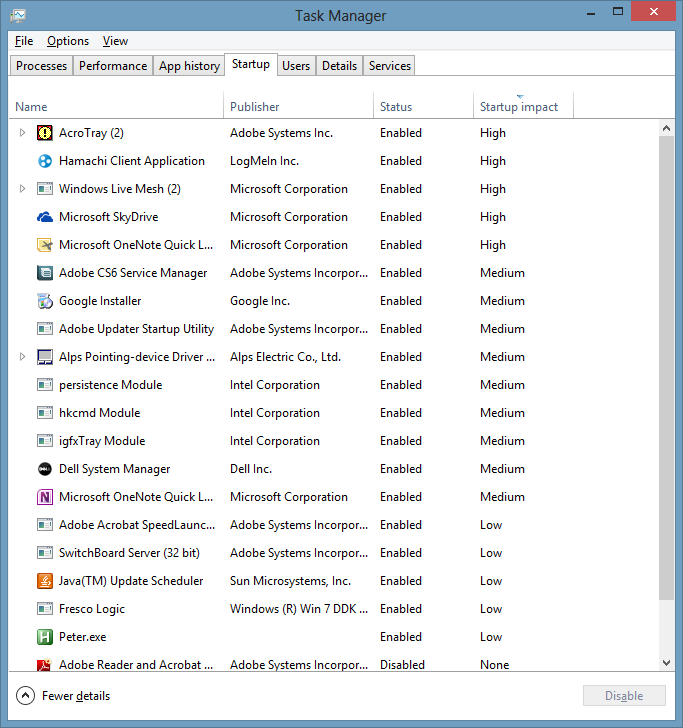 It shows much better performance information and in the Startup tab it shows you which programs are making your computer take longer to start up and lets you disable them. 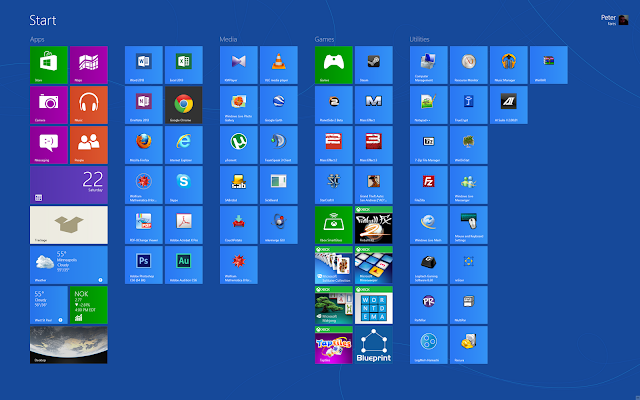 As you can see, Windows 8 brings a lot of awesome new features and not just touch support. It's very usable on the desktop and quite awesome, really. I am not agree about this, i don't think that this is awesome, maybe because i don't like the design, but its a little confusing for me, i like more the display of windows phone, that reminds me that i have to get a whats app download to my phone.